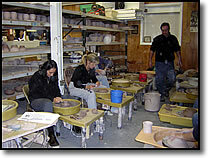 Classes offer firsthand experience of the entire pottery-making cycle. 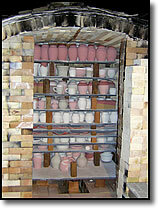 Beginning emphasis is placed on working with one of the sixteen potter's wheels. A slab roller is available to those who wish to try hand building. The course lasts eight weeks, with one three-hour class per week. 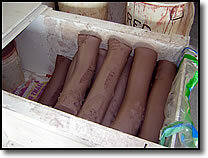 In addition to instruction, the fee includes all clay, glazes and firings, up to the first twenty pounds of bisque ware. After that, there is a charge of eight dollars per pound of bisque. Practice time is available whenever the studio is open (which is usually six days a week) and a class is not in session. Practice hours are subject to change. Call if in doubt. Registration must be made in person or by mail with an accompanying $50.00 check. Students will be placed in the order that payment is received. Enrollment: Present students have first priority, those on the waiting list are called in order of received application. A new class begins about every eight weeks. January - February, March - April, May - June, August - September, October - November. Mail in the Application Form with your deposit, or drop it off at Greenleaf Pottery.